The funniest thing about ‘The Ridiculous 6’ is that someone allowed it to be made. Is There a Grade Lower Than F? Well, there’s two hours of my life I will never get back. I know people say that a lot, but I’ve generally steered clear of that clichéd expression because I see life as always moving forward. Who needs the past when you have the present and the future ahead of you? Take the time to learn what the plastic tips at the end of shoelaces are. Unfold all the socks in my roommate’s sock drawer and mismatch them to create utter chaos. Un-Alphabetize my movie collection, and then re-Alphabetize it. Crack open a dictionary and memorize all the nouns. All of these options would have been a more productive use of my time. I would consider myself a fairly reasonable guy. If someone screws up my order at a restaurant or if someone cuts me off in traffic, I’m willing to forgive and forget. I would like to think the people who have done me wrong didn’t do it out of spite or callousness, but rather I chalk it up to a simple mistake grounded in forgetfulness and miscommunication. I’ve lived by this code for as long as I can remember, and I’ve never really strayed from it until this moment. Even as Adam Sandler has entered what can only be described as his “gives-no-shits” phase, I’ve tried to remain positive. Surely Sandler is trying his hardest, a young, doe-eyed Jacoby Bancroft thought to himself. Well, that optimistic young lad just faced reality and turned into a bitter, pessimistic old man. 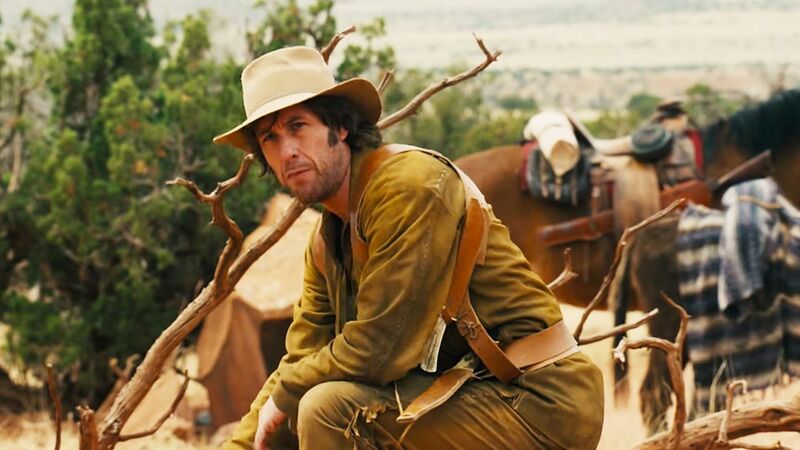 The only way to understand “The Ridiculous 6” is if you accept the fact that Sandler just doesn’t care anymore. It’s a half-assed, incoherent story that reads more like an eigth grader trying to write a screenplay than it does a legitimate, multi-million dollar production. It’s also painfully unfunny, which is extraordinary given the amount of funny people involved in it. An unfunny joke in a comedy movie is a given, but to have an entire movie structured around lame gags without proper punch lines is just insulting to the audience. There’s nothing clever here and the movie always goes for the crudest, lowest hanging fruit it can scrape by with. This is a movie that sees a donkey hit with a bout of explosive diarrhea not once, but twice! Sandler seems to think being gross is the same thing as being funny, and sometimes that’s true, but only when done with a certain finesse, something Sandler clearly doesn’t have anymore. There’s one scene in the movie that had potential to be really funny if it didn’t seem so out of place. Adam Sandler and his brothers stumble across a man inventing the sport of baseball. They agree to play with him and have to endure his increasingly selfish rules he makes up on the spot (like stealing bases when no one is looking, or calling it a home run when he doesn’t want to go get the ball after it was hit really far). It’s a gag that actually builds nicely, unlike anything else in the movie. The problem is that it doesn’t even matter to the plot. It’s like Sandler had this one funny idea and worked hard to shoehorn it in for no apparent reason. It’s a prime example of the lazy storytelling that made this movie so atrocious. When “The Ridiculous 6” was first announced, it turned heads. It was a film from one of the biggest movie stars in the world and it was going to be released entirely on Netflix. The streaming giant has grown exponentially over the last few years, but breaking into the original movies business with big-name stars attached was a huge step for the company and online streaming in general. Though if this movie is a representation of what’s to come, we are in serious trouble. If this trend continues (which it definitely will), I’m afraid that quality is going to be the factor that suffers most. These streaming services don’t care if you like the show or not. All they want you to do is keep subscribing to their service and maybe click on a few titles every once in a while. If it’s an extremely popular program, that’s great! If it’s a trendy program that gets critically bashed, but causes a lot of people to check it out just to confirm how bad it is? That’s great too! I understand comedy is subjective. What I find funny, other people will hate and vice versa. I’ve always been very accepting of other people’s comedic tastes, but I just can’t do that here. “The Ridiculous 6” is a bad, unfunny movie. If you disagree, I’m sorry to tell you that you’re wrong. I usually like to end my articles on a positive note, but after watching this movie, what’s there to be positive about?